In car accidents nobody says, "You hit my car with your car!" We say, "You hit me!" Likewise, when we're playing a Tomb Raider game nobody says, "That guy shot Lara Croft", we say, "You shot me!" Or you bit me, drowned me, knocked me off a cliff, or impaled me on a rusty pipe. Lara goes through a lot. The point is, no matter how different we are from the character on the screen, we react in the moment as if the things that happen to her are happening to us. Even separated by a third-person perspective, we are Lara. 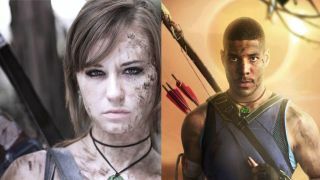 There's a community of cosplayers who specialize in portraying Lara Croft, even adopting her surname on social media. It's from these dedicated fans that the official Tomb Raider ambassadors were chosen, representing her at events like E3 in the build-up to the release of the next game in the series. Saylum Croft and Raymond Croft were two of those ambassadors this year and, to get the obvious out of the way, Raymond does not look like the traditional Lara. "Lara Croft isn't a body type, she is a state of mind," Raymond says. "I met plenty of people who were so happy to see a male cosplaying as Lara, especially at an official Tomb Raider event. I also met a few people who have told me I inspired them to cosplay as Lara and other female characters which is a huge honor. To anyone who feels like they can't cosplay as Lara Croft because you feel you don't look like her, you can!" Obviously, not everyone is so accepting of the idea of Raymond being one of the official faces of Lara at E3. Among the other cosplayers though, he's much admired for his hard work and the quality of his outfits and props. "He’s one of my biggest inspirations and I’m so so proud of him," says Saylum. "He gets so much hate for cosplaying as Lara but he deals with it beautifully." She's very much of the opinion that anyone who wants to be Lara can. "It doesn’t matter what your skin color, gender, weight, or height is. At the end of the day we’re all just a bunch of nerds dressing up to have fun." Lara's come a long way from her days as a pointy, polygonal action figure to become an icon for body positivity and representation. But while they mainly cosplay the modern version of the character, both Saylum and Raymond have similar memories of falling in love with her when they were five or six years old, back when Lara fought T-rexes without ever seeming to get dirty. Nowadays, being covered in muck is basically a defining trait of hers, and one both Raymond and Saylum put a lot of effort into getting right. Raymond uses a mix of different kinds of make-up, including a Halloween brand called Zombie Dirt. "Sometimes I'll even go outside and wet some dirt and use real mud and dirt as well," he admits. "It's hard sometimes to give off a naturally dirty look." Saylum puts a lot of effort into it too, and was once stopped in a shop by someone who genuinely thought she was hurt. "I don’t actually roll in dirt or coffee grounds," she says, "I use a rubber-based paint and different techniques to create splatter and general muddy looks. Getting 'dirty' is kinda an art within itself. You can’t just take paint and smear it on your body, it doesn’t look realistic that way. I start with watered-down paint and a spray bottle for a base. Then I go in with a sponge and paint from the tube. I dab or wipe this in areas that I know my body would get dirtiest." After she's grimed up her shoulders, elbows, chin, knees and so on she applies fake cuts using a red cream make-up and then layers blood on top of that. "Layers are really important when doing realistic dirt makeup!" The other iconic thing about modern Lara is her bow. Raymond says he has a love/hate relationship with prop-making, that it's his favorite part of cosplay but also the hardest. He's made several bows, the current one modeled on the bow from Shadow of the Tomb Raider is a PVC bow he bought on Etsy then modified and repainted to get it looking as authentic as possible. "It was a fun prop to tackle," he says. "I've also made a bow from the trunk of a tree, as well as a stick bundle bow. When cosplaying as reboot Lara, the bow is definitely something you'll want to focus on." Saylum puts a lot of effort into the little things, often details only she will notice, but she cares enough about the character to want to do her justice. "I personally find the hardest part to be making it realistic," she says. "I want to actually be able to move around and sit without worrying about my gear breaking or bending. Videogame logic says she can have 10 ammo pouches on her belt and a knife and a rope and that belt won’t move an inch from off her hips. Trying to recreate that while at the same time being comfortable can be really difficult at times. My favorite thing to ask myself is 'how many pockets can I add while still making it exactly like my reference?' Pockets are a lifesaver on any cosplay." Shadow of the Tomb Raider is only days away from release, and both Raymond and Saylum are excited about it. They cite the challenge tombs and the underwater areas as looking like highlights, but they're also very interested in what's coming for the story. "I'm also really excited to see Lara as a more fleshed-out character," says Raymond. There's definitely a sense among all the fans I've heard from that Rise of the Tomb Raider kept Lara on hold, and that the development they'd hoped for after her introduction in the 2013 reboot is more likely to happen now, in the hands of a different developer. It would be nice if it did. Though they share nostalgia for the classic incarnation, the cosplayers and other fans who have dedicated themselves so thoroughly to new Lara have an infectious enthusiasm that's done more for my interest in Shadow of the Tomb Raider than any of its marketing. They've become her just like we all do when we play the games, and like her they deserve a win.